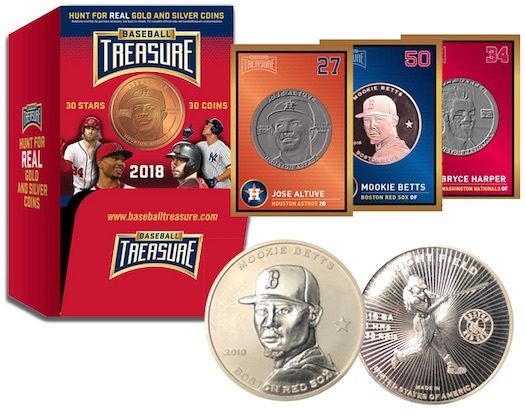 A debut option for collectors, the 2018 Baseball Treasure MLB Coins set combines several elements into one intriguing collectible coin release. Although coins are not new to the hobby as Upper Deck released a premium coin product in 2017 and Topps has produced coin-style sets in the past, this overall presentation is fairly unique. 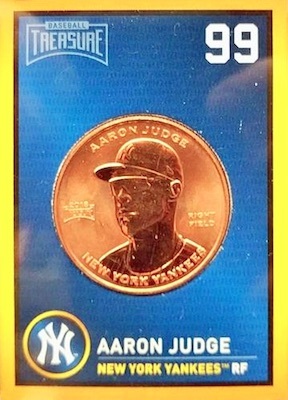 Much like a normal card product, the coins are issued in a blind-pack format and the sizing is similar to a standard trading card. Each pack has a suggested retail price of $6.99. The packs are sold at retail chains like Modells and hobby shops. One of the online options is Fanatics. Officially licensed by MLB and MLBPA, the 2018 Baseball Treasure MLB coins are 1.5" in diameter and weigh one ounce. For a reference point, the official U.S. half dollar is 1.205" in diameter, so these are a little bit larger than that. 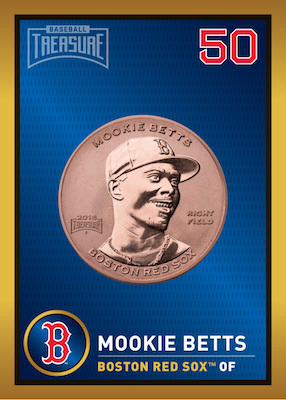 The base copper versions feature one player for every team—30 in total—set inside a color, trading card-esque cardboard mount. Each coin displays the player's name, position, and etched portrait on the front (or heads), and an action image with a few 2017 stats or accomplishments on the back (or tails). 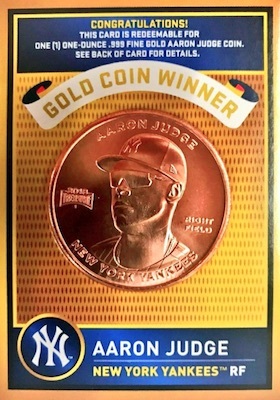 In addition to the 30-coin copper base set for 2018 Baseball Treasure MLB Coins, collectors can also hope for the rare chase coins. The .999 fine Silver version is a case hit at 1:432 packs (1:12 boxes), and covers the entire checklist. 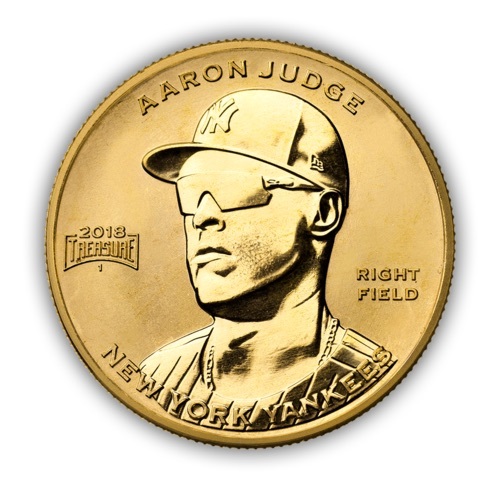 There is also the real Gold coin for Aaron Judge, which honors his rookie-record 52 home runs in 2017. This coin is issued as a redemption at a staggering 1:21,600 packs (1:600 boxes). 30 coin subjects. Buy packs or boxes on Fanatics. PARALLEL COINS: Silver (1:432 packs). Here are the top deals currently listed on eBay. A superb, beautifully-crafted coin set, mounted in a very attractive, sturdy cardboard frame the size of a traditional baseball card. Front side facial shots, back side action shots complete the package. To me, these coins are a grand slam. Beautiful items; however, after opening two (2) boxes, I found player distribution to be “odd” in that the 2 boxes had identical contents. Most big stars are readily available but lesser guys may be a challenge if trying to complete a set. I love these coins!! They are even more beautiful in person than they are in pictures/video. My favorite aspect is the “treasure hunt” for the gold and silver pieces. I have the full set at home and can’t wait for the release of Baseball Treasure II later in March! !